Overactive protein synthesis found in premature aging disease may also play role in normal aging. Scientists at the Salk Institute found that protein synthesis is overactive in people with progeria. The work, described in Nature Communications on August 30, 2017, adds to a growing body of evidence that reducing protein synthesis can extend lifespan—and thus may offer a useful therapeutic target to counter both premature and normal aging. Hutchinson-Gilford progeria is a very rare genetic disease causing people to age 8 to 10 times faster than the rest of us and leading to an early death. 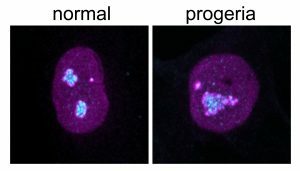 The rare mutation occurs in one of the structural proteins in the cell nucleus, lamin A, but it has been unclear how a single defective protein in the nucleus causes the myriad rapid-aging features seen in the disease. Along with the rapid turnover of proteins, the team found that the nucleolus, which makes protein-assembling structures called ribosomes, was enlarged in the prematurely aging cells compared to healthy cells. Even more intriguing, the team found that nucleolus size increased with age in the healthy cells, suggesting that the size of the nucleolus could not only be a useful biomarker of aging, but potentially a target of therapies to counter both premature and normal aging. The work supports other research that appears in the same issue showing that decreasing protein synthesis extends lifespan in roundworms and mice. The Hetzer lab plans to continue studying how nucleolus size may serve as a reliable biomarker for aging. The work was funded by the National Institutes of Health, the Nomis Foundation, and the Glenn Center for Aging Research.